North Shore Rolfing® clients include an array of human athletes, from surfers to triathletes to keep their bodies in balance and to perform their best. Recently we’ve expanded to equine athletes as well. If there is fascia and a nervous system, we can using Rolfing Structural Integration to help restore natural alignment, balance and ease. 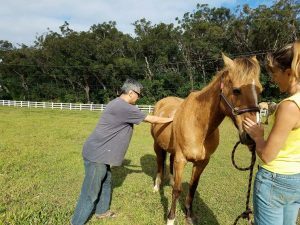 As in humans, minor injuries that have seemingly healed can plague a horse for the rest of his life because they create pulls and strains in the fascia. Progression of pain can be prevented or slowed by decreasing pressure on the compromised area of the body through Rolfing. We’d love to hear about your Equine Athlete and how we can help. Let’s talk.